Close to the romantic historic medieval town of Apricale, one of Italy’s loveliest cities is this 2 stories cottage for sale 140 m². Apricale is located in the province of Imperia (Liguria region). All primary facilities are present here such as; a grocery, a pharmacy, restaurants, bars, etc., and at a distance of only 25 min from the beach. 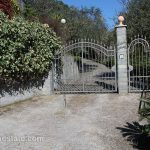 The cottage is beautifully located, surrounded by unspoilt nature with a great view of the Ligurian countryside, in the distance is the highest mountain village in Liguria Baiardo. A perfect place for nature lovers. The house is built on a plot of 2,000 sqm and there is enough space to build a pool. A paved road leads to the plot, except for the last 100 meters. This part is unpaved but well passable. The cottage consists of two levels. The first level (70 m²) is used for storage and wine storage. On the second level (70 sqm) is a living room with fireplace, 2 large bedrooms and one smaller, a bathroom and a kitchen. In the garden there is a vineyard, olive and fruit trees (apple, peach, kiwi), sheds and a water tank of 10,000 liters for irrigation. The house may need, depending on your wishes, refurbishment. Liguria Estate has spent the last 10 years specializing in the application of local permits, construction and renovations, project management and other necessary work. We are happy to serve you! If required our licensed architect makes a beautiful design for your dream project. If it concerns a second home for you regard what you want exclusively occupy or rent as return on investment, you can outsource the management to us. We optionally provide rental services and act as caretaker/concierge.